Halloween is a season for partying and for many people it is one of the best times for having fun Halloween parties. However, if you have been doing them for a while, or if you have never hosted a Halloween Party, it can be challenging to come up with a great idea for a party. Here are ten great Halloween themed party ideas. What better time of year is there for this? One of the main things people do to celebrate the Halloween holiday is to dress up. Offer prizes for various categories and let people know ahead of time what they are so that they can plan. Incorporate some fun Halloween games into your party and it is sure to please. Make all of the food in orange and black colors and dressed up with the themes of pumpkins, ghosts, and witches. There are lots of ideas online and recipes for this and you could even expand this party by encouraging all of the guests to bring a Halloween themed food item. Get a group together and go visit a local corn maze. You could even have prizes for the person who gets through the maze the quickest or who wears the best costume. Get together and watch the scariest parts of several movies. You could turn it into a contest by requiring the guests to guess which movie is which and then having a prize for the best answers. Get together and share some scary stories true or false. Again like with many of the other parties, you could turn it into a contest with prizes for the scariest story. Find ideas for 3-5 crafts related to the season and invite your guests to make them together as a group. Turn your house into a mini-haunted house and see how well you can scare your guests. Put together several Halloween games and activities and turn it into a carnival for a large number of people. You can include apple bobbing, fishing for prizes, races, and other fun themed games. The game can be played with 3 to 13 players. Use a standard card deck and spoons that number one less than the number of players. For example, with 6 players you would need 5 spoons. The goal is to collect four cards of the same rank. To start, deal four cards to each player and put the spoons in the center of the table so all can reach them. Players must choose one card from their hands, pass that card to the opponent on their left, and pick up the card they've received from the opponent on their right. Each player can never have more than four cards in his hand, so it's illegal for a player to pick up a new card before passing one to the left. When a player collects four of a kind, she discreetly picks up a spoon and places it before her on the table. The other players must then pick up the remaining spoons. The last player to pick up a spoon is the loser. Eliminate that player from the game and take out a set of four cards from the deck. Continue play until two people are the final winners. 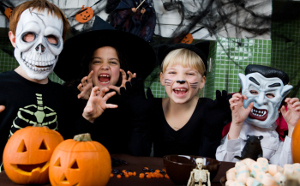 You can invite moms to bring their kids and do some Halloween activities and crafts together. For some great Printable Halloween Invitations, check out our Printable Halloween Invitation Page on our sister site, Free Printable Behavior Charts!